The mom life: mommy must haves. Diaper genie. I repeat DIAPER GENIE. I originally took this off my registry thinking who needs a glorified garbage pail!! Well I do. Not only do they hold a lot of diapers so I don’t have to change it daily, they keep the stink in and my pets out! I keep mine right in the nursery and you would never know that you were in the midst of several poopy diapers. A dresser/change table combo. I was talked out of getting a change table and for good reason. 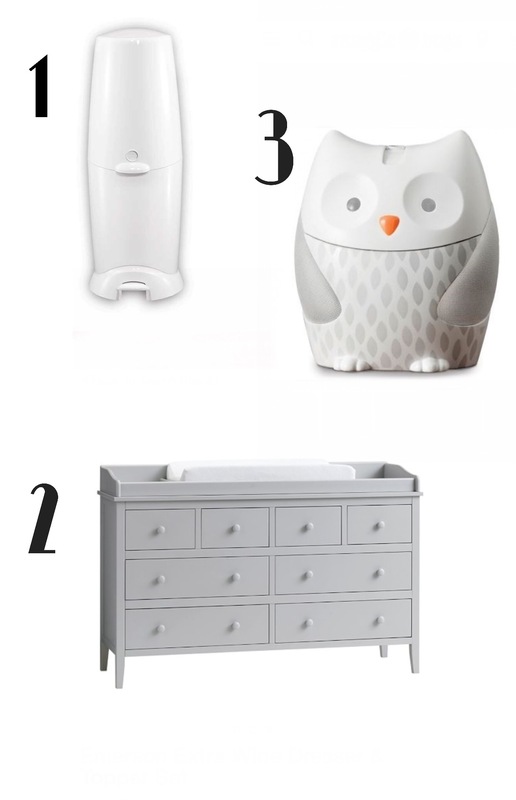 Not only do dressers at children’s stores come with the change table topper, they have space for wipes and creams on top and room for the thousands of little outfits you will end up with as your baby grows. Added bonus, when your kids get bigger you are left with a functional piece of furniture not a change table that you will likely get rid of. Worth the small investment I think! Night light/white noise machine. I got this super cute owl night light that also plays music and has white noise sound options. It is probably the most used item in my nursery. It helps keep things dim for night time feeds and offers soothing sounds to get my little one to sleep. Muslin swaddling blankets. My little man never liked having his arms swaddled after the first week of life. So these have been a life saver. They are large to I can create either a tight or loose swaddle and they allow me to keep his arms free. As of week 10 I still used them to cue night time sleeps! They also double up as a great blanket to keep your little one warm in the car seat, I just add a larger blanket on top when it gets chilly. Rocking chair. I truly think this is a must have. At night I sit in my chair to feed and then the rocking works like a charm to get him to sleep, especially now that he is a big boy, being able to sit and rock Bennett is a arm saver! When he is older I know I will be reading many a night time story in this chair too. And again when he is no longer a baby this chair can get a new slip cover and stay as a functional piece of furniture! A pack and play. We used ours as soon as we arrived home. I had stitches so I could only do stairs once or twice a day for the first week or two. Seeing as the nursery was located upstairs we set up the pack and play downstairs. We bought a Graco which comes with a change table and bassinet attachment, this was perfect for the first few weeks to have downstairs. We now use it when we go away and since he a too big for his bassinet we have it set up in our room until he is ready to move into his crib. I would say these are my top 6 favourite items. You of course have the necessities, but these are for sure items that top my list of must haves in the first few weeks. What are your mommy must haves?